that olive could make me give up almost anything, i think. 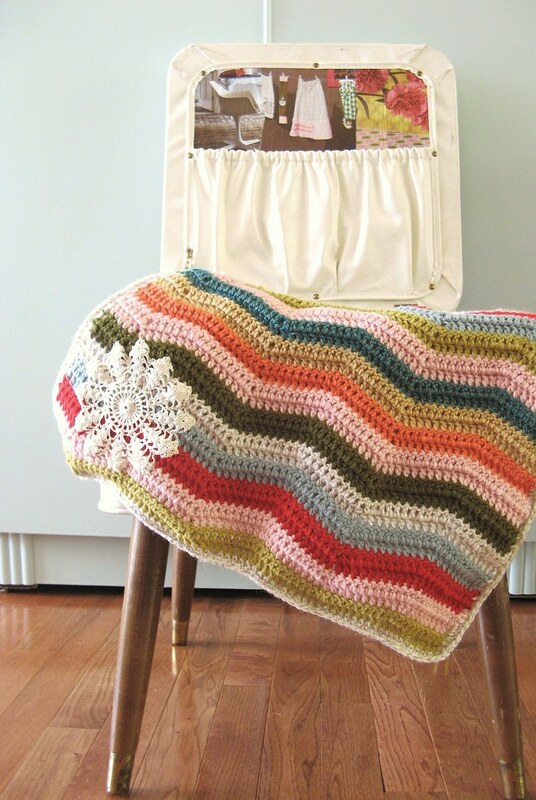 and, i understand her temptation, as i am really sort of wanting that blanket for myself and am already formulating a plan in which i learn to crochet and make one just like it. why, I do believe little olive looks amazingly like the Fisher Price pull toy from the 60's! 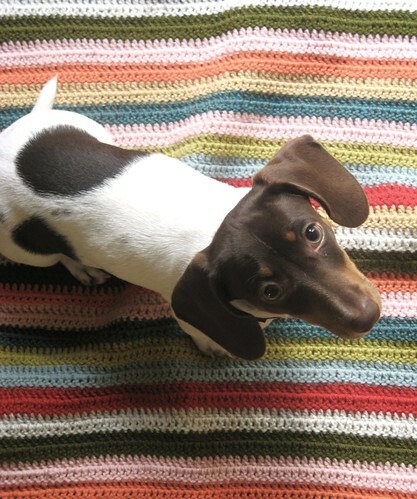 and truly, tif, it was only right of you to give her the newly finished blankie, and i am glad you saw that for yourself. bless her heart, she only wanted what was coming to her. I couldn't say no to that little face it's all too cute! She knows quality when she sees it, who can blame her really. You may now add my name to your list of growing challengers, as I too am going in boots and all. I've discovered that I've actually been living like this for a while now without even realising it. Imagine that?!! I do have a short list of exceptions which I will discuss when time allows. Thank you for your fabulous blog. Oh Tif, that first photo of little Olive looking at the camera - pure heartrending gorgeousness! Oh but how cute is Olive! I would be a 'mad dog' woman, too, with a dog that cute! 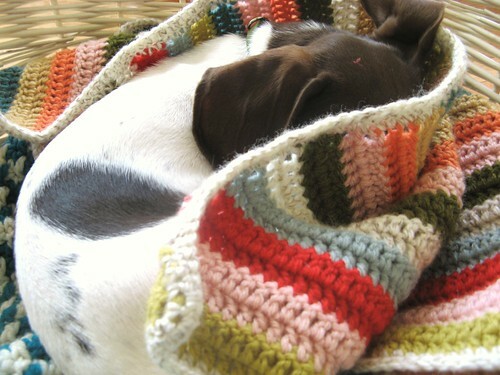 And, if I were Olive, I would have surely done the same with a blanket that pretty. I love those colors together! 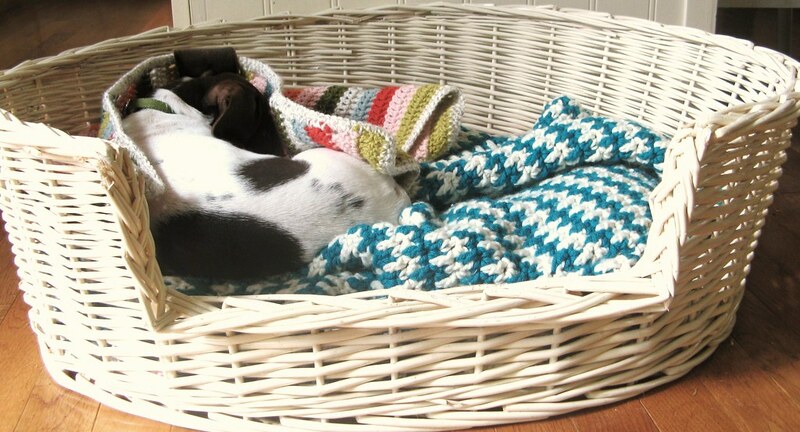 I am so jealous of your little dog sleeping in her picturesque little baskets. I can't have a basket, or it would be quickly smashed into pieces, and/or swallowed whole. Will you puhlEEZE measure around little olive's neck for me? That color she has on is not fitting for the pup of a crafter. What an adorable little Olive you have! What a sweetheart that little Olive is. My cat Maggie decided my "new" crocheted cushion was the prettiest thing she had ever seen and won't let anyone else on it. oh yes! she does look just like that fisher price toy! Oh please make a little vest. I hate those sorts of things normally but if it were a crocheted wavey vest I think I would love it. And wouldn't it be highly entertaining? !That dog is so cute, honestly. Olive is so cute. Can I hug her? LOL!! !